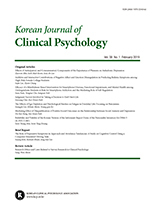 김보경, 민병배,(2006).청소년 우울과 지각된 부모 양육 행동, 기질 및 성격의 관계.Korean Journal of Clinical Psychology ,25(1),221-236. 본 연구에서는 기질, 성격, 지각된 부모의 양육 행동이 우울에 어떠한 영향을 미치는지 살펴보고 기질 및 양육행동이 우울에 미치는 영향에 대한 성격의 매개효과를 검증하기 위하여, 중학교 1, 2, 3학년 308명을 대상으로 청소년 기질 및 성격 검사-(JCTI)와 부모 자녀 결합 형태 검사(PBI) 및 우울 척도(CES-DC)를 포함한 설문을 실시하였다. 상관 및 회귀분석 결과, 우울과 가장 관련이 높은 변인은 위험회피와 자율성으로 나타났으며, 자극추구와 지각된 양육행동 중 돌봄 및 과잉간섭 요인도 우울과 의미 있는 관련성을 보였다. 구조방정식 모형 검증 결과, 우울에 대한 각 변인의 독립적인 경로만을 설정한 단순효과모형에 비해 자율성을 매개로 하는 경로를 포함한 매개모형의 적합도가 더욱 양호하였다. 위험회피와 지각된 양육행동은 각 변인으로부터 우울로 향하는 직접효과와 자율성을 매개로하는 간접효과가 모두 유의미하였으며, 자극추구는 자율성을 매개로하는 간접효과만이 유의미하게 나타났다. 본 연구의 결과, 청소년의 높은 위험회피 성향과 낮은 자율성, 지각된 부모의 부정적 양육행동은 우울에 대한 취약요인으로 확인되었으며, 기질 및 지각된 양육행동의 영향력은 자율성과 같은 성격적인 성숙도에 따라 부분적으로 달라질 수 있는 것으로 나타났다. 이러한 결과를 바탕으로 본 연구의 시사점과 제한점에 대하여 논의하였다. The primary purpose of this study was to investigate the influences of temperament, character, and perceived parental rearing behaviors, and the mediating effects of character on depression. A total of 308 adolescents were administered self-report measures of Junior Temperament Character Inventory(JTCI), Parental Bonding Instrument(PBI), and Center for Epidemiological Studies-Depression for Children (CES-DC). The results indicated that harm avoidance and self-directedness were most important variables associated with depression. Novelty seeking and perceived parental care and intrusion were also significantly associated with depression. The results of structural equation modeling revealed that harm avoidance and perceived parenting behaviors had both direct effects and indirect effects mediated by self-directedness on depression. The effects of novelty seeking were found to be completely mediated through self-directedness. The findings of this study suggests that high harm avoidance, low self-directedness, and perceived negative parenting behaviors are risk factors for depression, and the influences of temperament and perceived parenting behaviors on depression may partially depend on the maturity of character in adolescence. Based on these results, implications and limitations of the present study were discussed.